Once again, I've stayed away for too long. It's been a fun, but jam packed, past two weeks. I still haven't dropped out of my Bible studies, I've only missed a day or two of my Thy Word in a Year challenge, the PaperDoll Christmas season officially began with a flood of orders, our once a month cooking club started up again, I went to WHATVER CRAFT WEEKEND...for reals...I went!! AAAHHHH!! It was one of my most favorite things EVER!! Graham finished up his cross country season and did AMAZING after sitting out for 3 weeks with an injury and we had family pics taken by the amazing Annie Hankins. 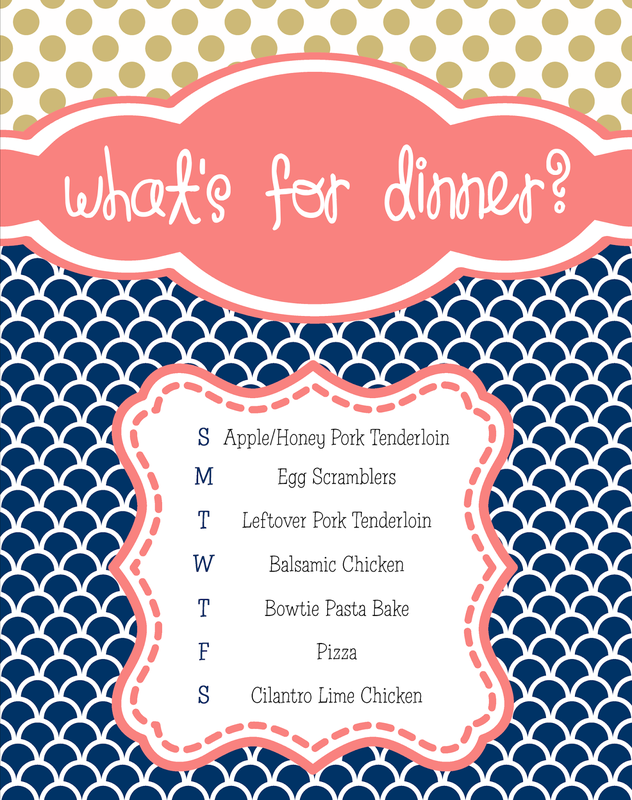 This week will be a little less crazy and I'm hoping to get back into a somewhat normal routine starting with meal planning. *I use my PaperDoll Designs Dry Erase Menu Board (THAT HAPPEN TO BE MORE THAN 15% OFF TODAY AND TOMORROW) that is very similar to the above pic to keep my family "in the know" about what's for dinner each week. It's in the crockpot right now...smells delicious! Egg scramblers by request...hash browns, bacon & biscuits. Everyone will be happy. There are two tenderloins cooking away right now so there should be plenty for leftovers on Tuesday. This will be a freezer meal from my Once a Month Cooking Group. I'm hoping the family will eat it. We aren't garlic lovers...we'll see. My kids really do notice if pasta falls off the weekly menu. They all love it. It's not my favorite but I love that there are no kiddy complaints. Mazzio's sausage thin crust is our favorite lately. I'm so glad we have finally ventured out of the all cheese pizza stage. This is another freezer meal. I'm so excited that we are meeting up again. It's AWESOME to have meals in the freezer ready to go!! THE DRY ERASE MENU BOARDS ARE MORE THAN 15% OFF SUNDAY AND MONDAY!! THEY MAKE GREAT CHRISTMAS GIFTS!! !